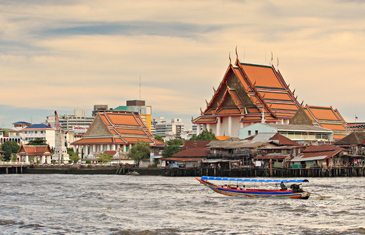 Thailand’s capital, Bangkok, ranks as one of the world’s top tourist destinations, popular for its street food, shopping, nightlife and inherent Buddhist culture with countless temples. We visit key attractions in this ‘City of Angels.’ One of Bangkok’s oldest temples and original school of traditional Thai massage, Wat Pho houses a sacred 45m (148ft) reclining Buddha. 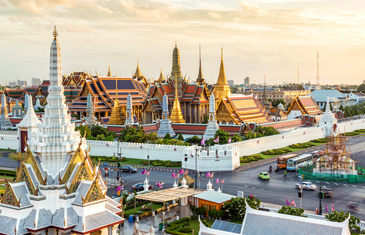 A tuk-tuk ride via Pak Klong Taland Flower Market brings us to the magnificent Grand Palace, home to Thailand’s most revered Buddha image, the Emerald Buddha. Take a long-tailed boat ride along the ‘klongs’ (canals) of Thonburi, alongside the Chao Phraya River, for an up-close glimpse of riverine life. We disembark at Wat Arun, iconic for its impressive 82m (269ft) high Khmer-style tower. A stroll around vibrant Chinatown evokes old Bangkok, visiting Yaowarat Road and bustling Talad Kao Market. In northeast Thailand, Udon Thani is an important regional hub, but best known as home to one of the world’s earliest bronze-age civilizations, located at Baan Chiang, located outside the city. Standing alongside the protected UNESCO World Heritage-listed archeological site, Baan Chiang National Museum displays earthenware pottery, utensils and bronze fragments excavated from ancient settlements here. Archaeological evidence indicates these relics date back to around 5,000 years. The Museum provides information on the excavation history and more. Back in Udon Thani, we stop-off at the Thai and Chinese Cultural Centre, housed in lovely gardens, where we learn about the history and culture of the city’s populous Chinese community. Today is devoted to exploring significant Buddhist temples in the region. We drive out to Wat Pa Phukon, paying our respects to the 20m (66ft)-long reclining marble Buddha Image, Praputthasaiyas Loganatsasada Mahamuni and Prapatom Rattana Boorapa Mahachedi, the Statue of the Meditation Master Monk of Vipassana. Later, visit Wat Pha Tak Suea in Nongkhai Province. This celebrated and serene mountaintop temple offers commanding vistas across both Thailand and Laos. The temple’s elevated vantage point has improved somewhat, with the recent construction of a U-shaped, 16m (52ft) long skywalk constructed in glass. Cross the border into Laos and head for Vientiane, Southeast Asia’s smallest capital city. Nestled along the banks of the Mekong River, this former French Indochina trading post exudes a laidback ambiance and old world charm. 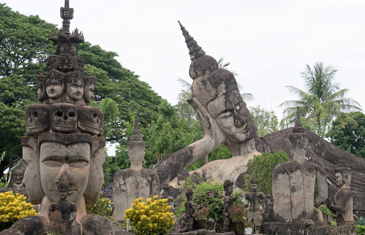 We head outside Vientiane for Buddha Park, vast landscaped gardens, dotted with whimsical Buddhist and religious images and sculptures. There is ample time to stroll around the park, viewing the quirky and ornate statues. Back in Vientiane, stop-off at a weaving home-studio, founded by an American textiles expert. 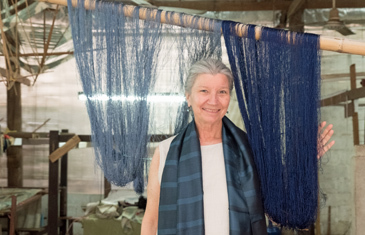 Now employing over 40 local weavers, the studio produces naturally dyed and hand-woven silk textiles, reflecting traditional and diverse Lao designs. A guided tour unravels the entire weaving process. Spend a fascinating half-day cycling to some of Vientiane’s most historic attractions. Wat Sisaket is one of the capital’s oldest surviving temples, noteworthy for its famous cloister wall, housing thousands of tiny Buddha images. Now converted to a museum, Wat Phra Keo was originally a royal temple. It boasts a still intact multitude of Buddha statues and magnificent, 16th century lacquered wooden door intricately carved with Hindu legends. In downtown Vientiane, That Luang, a 44m (147ft)-high gold covered Buddhist stupa, is regarded as the nation’s most important monument. We also stop at iconic Patuxai Victory Monument, an Arc de Triomphe-like war monument, adorned with typical Lao mythical designs. Nestled along Song River in Central Laos, charming Vang Vieng is popular for its idyllic scenery: limestone karsts jutting out of emerald rice paddies. Naturally, Vang Vieng has also evolved as one of Southeast Asia’s most beautiful adventure destinations. Limestone mountains towering over the town reveal hidden caves of all sizes and forms, which we explore on a full-day trek along with remote rural farms. Key cave systems include Tham Chang, doubling as a makeshift village shelter during the Laos’ civil war and Tham Loup, noteworthy for its spectacular stalagmites and stalactites. Enjoy a picnic lunch amidst this bucolic splendour before trekking to an organic farm that produces mulberry tea and fruit wines. A drive along steep, winding roads in mountainous northern Laos, leads us to Luang Prabang. Nestled at the confluence of the Mekong and Nam Khan rivers, encircled by verdant mountains, this ancient royal capital is considered the heart of Laotian culture. Baci ceremonies are an integral part of Lao culture, a ritual marking milestone events, such as marriages and death. This ancient practice is based on the belief that the ‘kwan’ (or soul), which watches over the body, will be realigned. In Luang Prabang, we have a unique opportunity to participate in an authentic Baci ceremony at a local family home. A village elder will wrap a white cotton thread around your wrist, while chanting mantras to strengthen the blessing’s power. To commemorate Luang Prabang’s 20th anniversary as a UNESCO World Heritage Site, the published guidebook, “A Walk through the Heritage of Luang Prabang” was written. Compiled by experts, this celebratory book highlights key heritage aspects of one of Southeast Asia’s most mesmerising destinations. Following their suggestions and accompanied by a local guide, we commence a unique walking tour of Luang Prabang. Atmospheric narrow streets reveal distinct colonial-era and Lao-style architecture. Our guide imparts the history behind the faded facades. Later, beyond Luang Prabang amidst emerald-green rice fields, we discover the significance of bamboo in Lao culture. We also learn about its traditional and modern uses and participate in bamboo weaving and cooking classes hosted within a traditional dwelling. 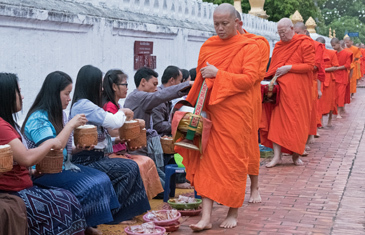 Luang Prabang’s early morning almsgiving tradition, ‘Tak Bat,’ is a deeply spiritual Buddhist ritual dating back centuries. At sunrise, quietly observe a procession of hundreds of saffron-robed monks receiving alms from locals lining the streets. 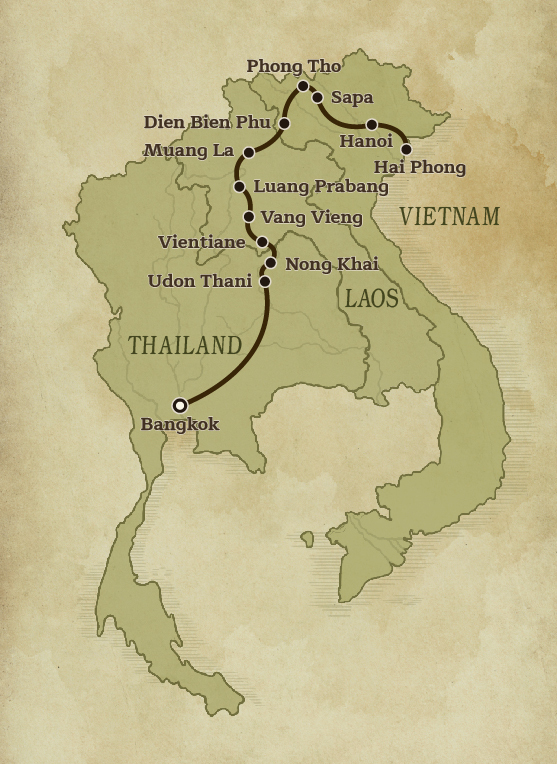 Later, take a river cruise upstream, where the Nam Ou and Mekong rivers converge. 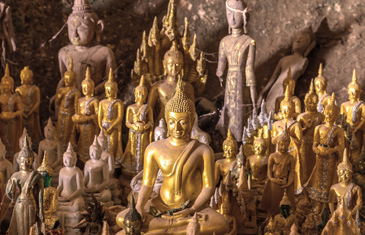 Perched high, the Pak Ou Caves secretly house approximately 4,000 sacred Buddhist statues and images Worshippers including Lao royalty have visiting this revered cave-temple for centuries. Enroute, we disembark at local villages, surrounded by verdant paddy fields. Muang La is a pastoral community of tranquil farmland and ethnic villages, framed by rolling mountains. An off-the-beaten track journey by four-wheel drive takes us deep into remote rural countryside, driving high into the mountains for spectacular views. We visit the isolated villages of two ethnic groups typical to Laos – the Ikhos and Hmong. In both villages, many of the inhabitants originate from Yunnan and Tibet. Here we can observe age-old traditions and gain greater insight into the villager’s daily lives, age-old customs and traditions. Drive to the Laos border, making the overland crossing into north-west Vietnam and arriving at provincial capital, Dien Bien Phu. Formerly one of Vietnam’s largest opium-producing regions, Dien Bien Phu is more infamous for its starring role in Vietnam’s modern history. The town’s outlying valleys and forested hills were the scene of a decisive battle and defeat of the French colonials by the Viet Minh – a climactic confrontation of the First Indochina War. The Battle of Dien Bien Phu, fought between March and May 1954, significantly marked the beginning of the end of the Indochina empire. Amongst stunning mountain scenery, key battle sites to visit include A1 Hill, a key French strong-hold, Muong Thanh Airbase and a Viet Minh cemetery. From Sapa town, head to the remote Black Hmong villages of Sa Xeng and Sau Chua, nestled in a narrow valley, encircled by soaring mountains. Leaving the main road, we take a two-hour hike to reach these villages, which actually comprise of four hamlets scattered along the pastoral valley. Our walking route winds its way down from high mountainside trails, passing farmlands and magnificent terraced rice fields, to down in the valley, alongside a stream. Enroute Hmong ethnic people pass us, going about their daily lives and farming activities. We explore both Sa Xeng and Sau Chua villages, stopping off at several stilt-house dwellings to get a taste of remote mountain life. Vietnam’s mountainous north-west region is home to diverse hilltribes, many of these ethnic groups individually identifiable by their colourful traditional attire and headdresses, embellished with embroidered designs. An important part of the mountain life is local ethnic markets, each corresponding to a different area and invariably held on a specific day of the week. On market day, various hilltribe groups come down from the mountains not only to buy and sell products, but also to socialise and gather over rice wine. Dependent on the day, we visit a corresponding local market. Combined with a short trek, this is a fantastic opportunity to encounter the ethnic minority peoples, including Flower H’mong, Dzao and Phu La, in remote mountainous locations. From Vietnam’s capital, Hanoi, drive southeast, embarking on the luxurious Ginger cruise ship, a traditional-style Junk boat. 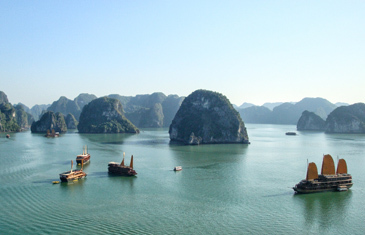 We first cruise through Halong Bay, one of Asia’s most magnificent natural splendours and a UNESCO World Heritage Site. Here, a surreal seascape of over 1,600 largely uninhabited limestone islands and islets jut out of the Gulf of Tonkin’s emerald green waters. Disembark at Cat Ba Island, the bay’s largest island, part-protected by a National Park, cycling to a small village. 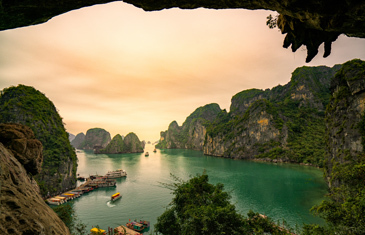 Sailing deeper into the bay, our cruise ship reaches Lan Ha Bay; equally stunning, but relatively more tranquil – only recently opened to tourists. Enroute, leisurely glide past a spectacular maze of karst islets, grottoes, coves, and lagoons, plus an unexpected French colonial-built lighthouse. Onboard activities include spa treatments and nighttime squid fishing. Greet the day with an early morning Tai Chi session on the upper deck, continuing with exploring the clear, tranquil waters of Tra Bau in a kayak or bamboo boat. After disembarking, we return to Hanoi and later, attend a Four Palaces (‘Tu Phu’) show, a spiritual ritual performance featuring trance-like dances and elaborate colourful costumes. This show is inspired by ‘Tho Mau Tam Phu’ folk art, the worship of ‘Mother Goddesses’ and female deities, to help bring good luck, happiness and fulfilment. Unique to northern Vietnam, this has been recognised by UNESCO as an Intangible Cultural Heritage of Humanity. Pre–performance, we get an exclusive behind-the-scenes look, meeting some of the Hau Dong performers.